MenEngage (2015). 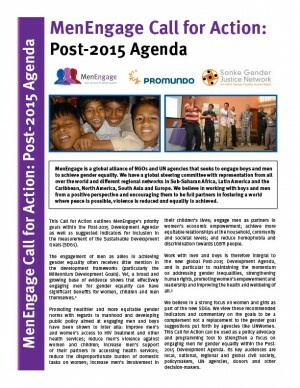 MenEngage Call for Action: Post-2015 Agenda. MenEngage, Promundo, and Sonke Gender Justice. This Call for Action outlines MenEngage’s priority goals within the Post-2015 Development Agenda as well as suggested indicators for inclusion in the measurement of the Sustainable Development Goals (SDGs). The engagement of men as allies in achieving gender equality often receives little mention in the development frameworks (particularly the Millennium Development Goals). Yet, a broad and growing base of evidence shows that effectively engaging men for gender equality can have significant benefits for women, children and men themselves. We believe in a strong focus on women and girls as part of the new SDGs. We view these recommended indicators and commentary on the goals to be a complement not a replacement to the gender goal suggestions put forth by agencies like UNWomen. This Call for Action can be used as a policy advocacy and programming tool to strengthen a focus on engaging men for gender equality within the Post- 2015 Development Agenda. Its key audiences are local, national, regional and global civil society, policymakers, UN agencies, donors and other decision-makers.